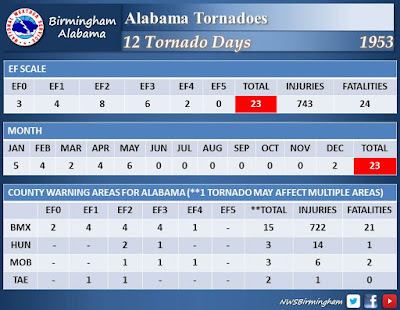 At least four tornadoes occurred in Alabama on this date in 1953, including two that are thought to have been of F4 intensity. Nine people were killed and 17 were injured in Alabama that day. Tornado #1: Chilton County F2 5:15 p.m. This tornado was on the ground for 1 ½ miles in the Minooka community about 4 miles south of Calera. There were no fatalities, two injuries, three homes destroyed and five other homes damaged. Tornado #2 Clay County F4 7:30 p.m. 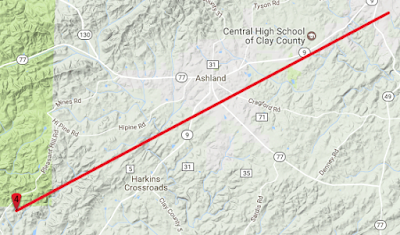 This tornado was on the ground for 12.1 miles in the Millerville-Lineville area. The damage path was as wide as 440 yards. There were seven fatalities, 12 injuries, 19 homes destroyed and 50 other homes damaged. 36 other buildings were destroyed and 57 other buildings were damaged. Numerous chickens were killed and stripped of their feathers. “Although it occurred three years before my birth, I often heard my parents speak of this storm. Late in the evening at dark while frying fish with another couple, my mother (who was pregnant with my older brother) heard an all too familiar roar much like she heard on March 21, 1932 as her home was destroyed in Paint Rock, Alabama. The others insisted that it was a train, but Mom insisted that it was a tornado. "Once you hear that sound, you never forget it." They stepped outside to look around and the funnel was less that two blocks away. Dad described it as a slender wedge with much debris aloft, the base of the funnel gyrating in a looping fashion. They jumped into the car to outrun it, but noticed it was moving away from them. 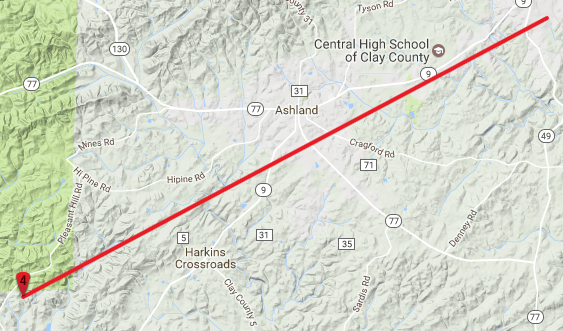 Their perspective would have been on State Highway 49 just south of Lineville but north of the tornado's path. Dad was the local dentist and spent that night at the hospital in nearby Ashland helping treat victims of the storm. I am very thankful they didn't pursue outrunning the tornado, especially at dark! Strangely, this storm occurred at the same time as the Paint Rock Tornado”. Tornado #3 Jefferson County F1 8:00 p.m. This tornado was on the ground for only one tenth of a mile in Trussville. There were no fatalities, no injuries, and five homes destroyed according to the NWS. Tornado #4 Choctaw County F4 8:00 p.m. This tornado was on the ground for 10 miles in the Riderwood-Lisman area. The damage path was as wide as 200 yards. There were two fatalities and three injuries. Debris was thrown over one-half mile. 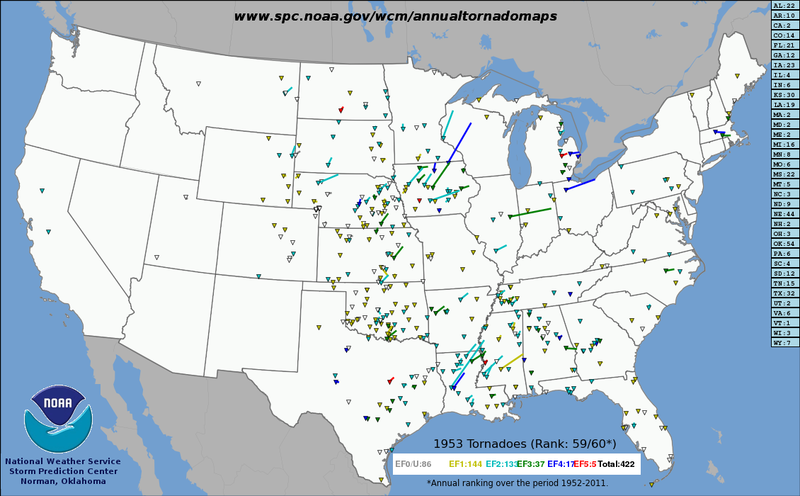 1953 Was an active year for tornadoes.